Most armies have embraced the ambition of ‘every soldier a sensor’. To achieve this, every infantry soldier must be able to observe, acquire targets and accurately engage the enemy at night and in poor visibility. The ability to operate effectively at night has become particularly important for armies committed to operations in Afghanistan and Iraq as part of the Global War on Terrorism (GWOT). Three categories of night vision systems are available for dismounted soldiers: weapon sights; helmet- or head-mounted night vision goggles (NVGs); and, handheld devices, some of which can be mounted on small tripods for extended surveillance missions. Most European soldier modernisation projects include systems in all three categories. Urgent operational requirements (UOR) driven by the GWOT have in some instances, expedited the acquisition and fielding of night vision systems in advance of comprehensive soldier system projects. The British Army’s Future Integrated Soldier Technology (FIST) is one example. Although the FIST Assessment Phase, launched in 2003, has demonstrated that while some planned technologies are as yet too immature to be fielded, it also clearly showed that new surveillance and target acquisition technology offers significant benefits. UORs have significantly boosted the infantry’s NV capability since the start of the GWOT. Every member of a British infantry platoon is now equipped with an ITT Corporation Head Mounted Night Vision System (HMNVS), a monocular image intensification (II), which is used in conjunction with a Laser Aiming Module fitted to the soldier’s weapon. However, the HMNVS does not function effectively below a certain level of ambient light while bright artificial light can cause the system to ‘white out’. To overcome these shortcomings, each four man fire team, which is already equipped with two Qioptiq Kite Common Weapon Sights (CWS), is also being equipped with a pair of Qioptiq Viper thermal imaging (TI) sights. The Kite, designate the CWS in UK service, is designed for use on short and medium range weapons. It weighs 990g, excluding its two AA batteries, and provides 4X magnification enabling the user to recognise a standing man at 500m in starlight conditions. The MaxiKite-2 is designed for longer range weapons such as 7.62mm and .50 calibre machine guns; 6X magnification enables recognition of a standing man at 750m in starlight. The sight weights 1.36kg and two AA batteries which provide up to 70 hours of life. The 1X Sniperkite sight, which weighs less than 1.5kg, is designed to mounted in front of Schmidt & Bender day sights, although it is compatible with ‘most’ other sniper rifle scopes. Two AA batteries provide up to 100 hours of continuous use. The 3X Vipir TI sight is intended for use on 5.56mm weapons enabling a soldier to acquire a man at ranges of 400 to 600m. Four AA batteries provide six hours of use at moderate temperatures. The Vipir-2 TI sight is intended for use on 5.56mm, 7.62mm and .50 calibre weapons enabling the firer to detect a man at ranges up to 1,200m. It is available with a 9° field of view and 2.7X magnification or a 6.5° field of view and 3.6X magnification. It is also powered by four AA batteries. Qioptiq launched the SVipir-2+ at DSEi 2007. Powered by four AA batteries which provide up to six hours of use the SViper-2+ is optimised to be mounted in front Schmidt & Bender day sights enabling snipers to detect a man at up to 1,500m. The sight weighs less than 1.5kg. Qioptiq UK received an initial contract from the UK Ministry of Defence In January 2007 to supply over 450 Vipir-2s and the following month Thales Australia, acting as prime contractor, awarded Qioptiq a contract to supply the Vipir-2, spares and support for the Australian Army’s Land 125 Soldier Enhancement Programme. In 2008 the Vipir-2 was purchased by an unspecified by NATO army. Thales Land & Joint Systems has sold more than 6,000 Sophie handheld TI binoculars to military, paramilitary and public service agencies in more than 45 countries including over 600 produced for the French army, air force and navy since January 2005. Sophie can detect a human at more than 5km and a vehicle at more than 10km. It weighs 2.4kg and can be mounted on a tripod for extended surveillance missions. The Sophie MF (Multi-Function), which weighs less than 3.5kg, combines the features of the Sophie with an eye-safe laser rangefinder, a GPS, a direction finder and a laser pointing system. The Thales Lightweight Universal Night Observation System (LUNOS) family consists of a common body, several high speed objectives with different magnification factors (1X, 4X and 6X) and a number of options, such as face mask, grip, monopod and reticle for 6X. The accessories enable a LUNOS to lightweight 1X magnification NVG to be reconfigured as a long range, tripod mounted 6X surveillance device in only one minute. The Multiple Use Night Observation and Aiming Sights (MUNOS) family is based on the same modular approach. The common Tube Module with standard I2 tube can be used with the short range 4X WS4, medium range 6X WS6 or long range 10X WS 10 Body Module. The LION (Lightweight Infra-red Observation Night) sight is a hand-held, lightweight, uncooled thermal imaging viewer for day and night use; the latest variants are the LION Advance and the LION Advance XP (for extended performance). 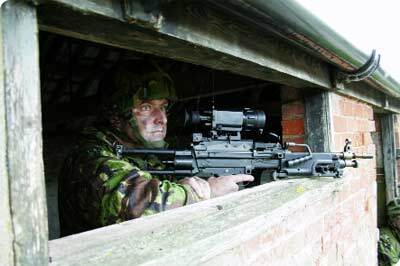 In February 2008 Thales UK received a £30m contract from the UK to supply more than 700 of its latest Joint-Target Acquisition System (J-TAS) to meet the MoD’s Surveillance System and Range Finding (SSARF) requirement. The J-TAS combines daylight and thermal vision with eye-safe laser range finding, embedded military GPS and azimuth angular referencing. Users, including artillery and mortar fire controllers, will be able to provide accurate target location out to 5km at night. The J-TAS is scheduled to enter service later this year. 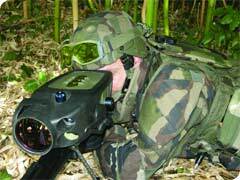 In October 2008 Sagem Défense Sécurité, prime contractor for the French Army’s Fantassin à Equipement et Liaisons INtégrées (FELIN) soldier system project, announced that it has selected the Thales Minie D NVG for FELIN. Showcasing the Minie D at Eurosatory 2008 Thales claimed the system provides a 30 percent reduction in weight in comparison to current NVGs while providing a 20 percent improvement in optical performance achieving a resolution ‘higher than existing HDTV’. The Minie D also incorporates an integrated OLED video which allows external data such as weapon sight images or maps to be displayed. Thales is confident that selection for FELIN will lead to sales for other future soldier systems. Sagem has developed three new weapon sights for FELIN. The FAMAS IR and FAMAS IL both incorporate two independent day/CCD video channels giving narrow and wide fields of view. The FAMAS IR is an uncooled TI sight capable of detecting a human at 600m while the FAMAS IL is an II sight able to detect a man at 500m. For use with the FRF2 7.62mm bolt-action sniper rifle snipers will be equipped with a Lunette FRF2 sight which incorporates at a direct-view optical channel, an uncooled IR channel and a laser rangerfinder. As part of the Infanterist der Zukunft (Infantryman of the Future) project the German Army is equipped with the AIM HuntIR TI sight which entered series production in December 2004. The 2.5kg HuntIR, which can be mounted on the 5.56mm G36 assault rifle, the 5.56mm MG4 LMG, the 7.62mm sniper rifles and the .50 calibre G82 sniper rifle, allows the user to detect a man at ranges up to 1,500m. To meet the needs for the Infanterist der Zukunft-Erweitertes System (IdZ-ES; Infantryman of the Future-Enhanced System) AIM is developing an improved sight dubbed the RangIR which incorporates a laser ranger finder, three-axis digital magnetic compass and a wireless data link.